It's long been said that the team spirit is the best it's been in a long time at Arsenal this season. There were lots of social gatherings organised by the Greedy Badger when he was captain, but there wasn't the collective spirit that is now so obvious on the pitch. 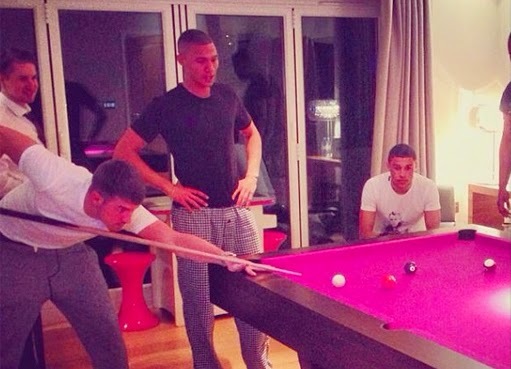 It always brings a smile to my face when I see pictures like the one posted by Aaron Ramsey on his Instagram account last night of Alex Oxlade-Chamberlain, Kieran Gibbs and himself playing pool. The pictures from the player's Christmas party are yet another example of the unity and bond there is among this group. And it's these special relationships which transfer on to the pitch. You're more likely to run that bit harder to help out a team mate if you like the guy, than if you don't. And there doesn't appear to be the divisive character's in the dressing room. And I'm not counting Nicklas Bendtner in this, because everyone know's he's a bit weird. A player who hasn't featured in the team this season for an extended run is Thomas Vermaelen. His contract is up next summer, so it looks set to be an interesting time for the Arsenal captain. Normally the club would look to sell a player who is still in the prime year's of his career if they hadn't agreed to a contract extension. And you would think there is little opportunity for Vermaelen to play now Wenger has found his ideal partnership in Per Mertesacker and Laurent Koscielny. But there appears to be an offer on the table for the Belgium international to stay beyond the summer of 2015. The Daily Mail report Wenger will hold talks with the club captain before the World Cup over his future with a view to keeping him at the club. It would be interesting if the 28-year-old did sign a new deal and also very welcome. There aren't very many third choice central defenders in the league who have Vermaelen's quality. We need a squad with depth if we're to challenge for every trophy and the back up players need to be of a good enough standard to be able to stand in for a period of games if a first choice player gets injured. We've seen this season the rotation Wenger has used in the attacking positions on a game to game basis. Only Olivier Giroud is guaranteed a place in the forward line. All of the five players behind him have been switched in and out. But that's not been the case in defence. Wenger has stuck with Bacary Sagna, Mertesacker, Koscielny and Kieran Gibbs if they are all fit. And it's paid off, with the Gunners keeping 13 clean sheets this season in the league. By all accounts Vermaelen has been very professional in his attitude towards what's gone on since he lost his place in the team. If he did stay next season there would have to be questions about whether he continued as captain. I think the majority of Gooners want Mertesacker to take over the captain's armband and I would certainly like that too. Clearly if Vermaelen stayed and the captaincy was taken away from him, that would have to be managed very carefully. Someone also talking to the club about a new contract is Bacary Sagna, a player I'd love to see playing at the club for years to come. Finally, Arsene Wenger has been talking ahead of his 1,000th game and has revealed his drug of choice... football. Who would have thought that?